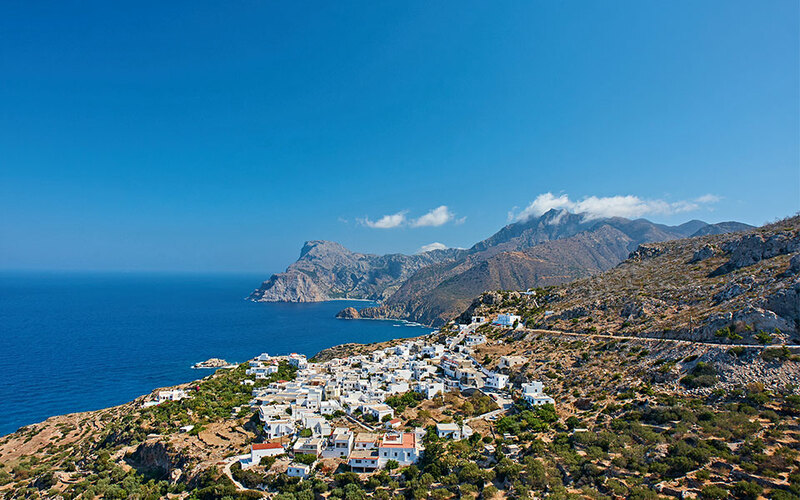 Built on a hill, Mesochori, Karpathos stands out for its view. Karpathos may officially belong to the Dodecanese, but a visit will reveal that there is no place on Earth quite like it. Karpathos is the boundless sea backed by tall, steep mountains. It is the waters at its dozens of beaches: green in Apella, blue in Lefko, turquoise in Afiartis. Karpathos is a cool breeze, gentle and steady, on our backs and on our faces. It is the people who look in the morning to see which peak will be capped by a cloud, walking slowly, gazing in the distance. 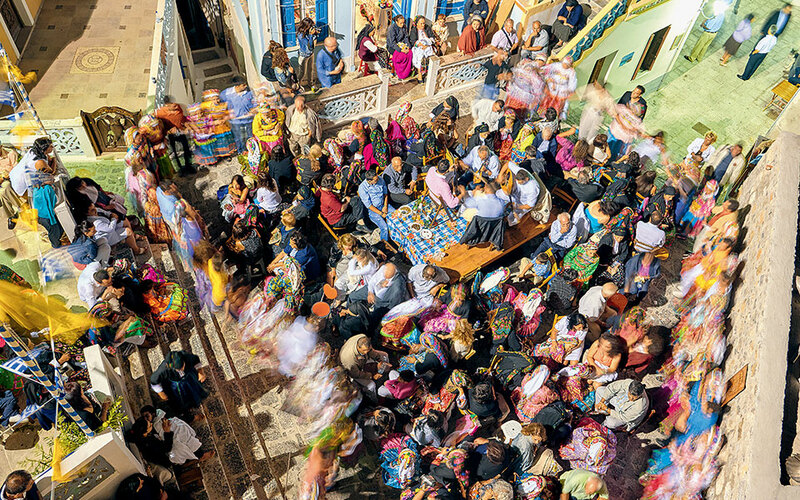 Karpathos is to dance the sousta and pano dances until the early hours at the traditional panigyria (festivals), at times stepping lightly, stomping heavily at others until you reach the plane of Dionysus. Karpathos is to be surprised that every bend hides a different landscape; it is the scent of wild thyme, and that of the bakery that is making traditional onion bread and onion biscuits, and sesame seed-covered bread rings with cumin. A traditional festival in the village of Olympos on August 15th. Karpathos is the beach of Aghios Nikolas in Arkasa, gazing at the view of the neighboring island of Kasos as the sun sinks behind Paliokastro, the onetime home to the largest slave market in the Mediterranean. It is the women who speak in a sing-song voice and see every child of the village as their own, and who stage comic plays in the middle of the square. Karpathos is Giannis the fisherman in Foiniki telling you stories about all the dollars he turned down in order to be able to wake every morning in his blessed land. It is the American accent of the members of the diaspora who return every summer full of excitement, and leave filled with melancholy. Karpathos is the difficult goodbyes and joyous reunions. Karpathos is the strong, otherworldly women of Olympos, there where myth has it that the gods of Olympus sought shelter, and where Prometheus spent a large part of his life. It is the brides-to-be with their heavy, traditional necklaces, and those who have married young whose mothers look like sisters. Karpathos is for the sit-down feast to never end as we improvise, enjoy each other’s company and do battle with mantinades (short, humorous verses) directed at one another. It is an art form that elevates the spirit – and then the words are carried off on the wind and the the lyre and lute take over. Karpathos is to converse in song, an art that has ancient roots. Karpathos is the red wine of Othos and the panigyri of Aghios Panteleimonas and the delicacies offered freely to all passersby in Menetes and Pyles on August 15th. It is the silence of Mesohori at sunset and the women in the square who say “welcome daughter” in hushed voices so as not to disturb the sacred hour. Karpathos is the panigyri of Aghios Ioannis in Vourgounta, in the little church that is built over a cave almost below sea level. It is the mystery of the tavla songs and the sun that rises before the dancing is finished. Karpathos is the insistence of its people to return to this strange world at the southeastern corner of the map of Greece. Karpathos is the staccato dialect that you yearn to speak and hear again, with its humor and the impromptu poetry that emerges from its simplicity. 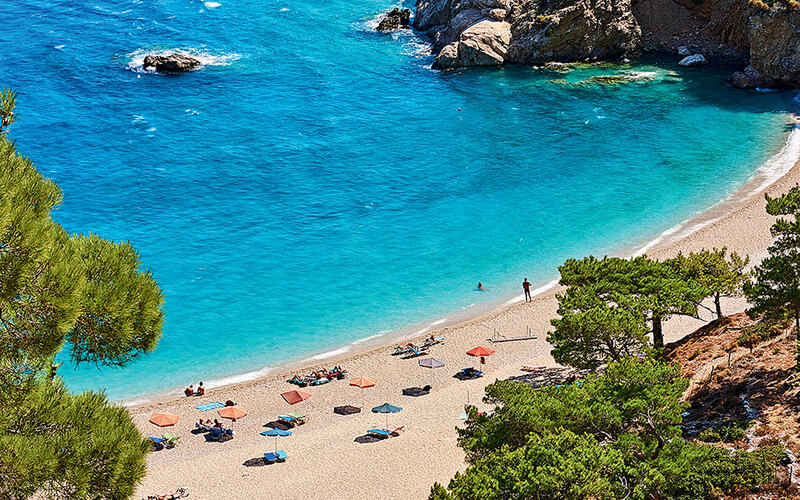 Karpathos is the restless land that you either fall in love with, or never set foot on again. It is not a place to simply be liked. *Fotini Lambridi is a journalist with the news website TVXS, a lyricist and radio producer.